Welcome to the Couett’Hôtel Oloron Sainte-Marie: a hotel of the open air ! Are you searching for a hotel in the Pyrénées Atlantiques ? Look no further. In its modern white structure, red enhancements, the Couett’Hôtel Oloron Sainte-Marie is in perfect harmony with a region breathing beautiful scenery and fresh air. Choose the Couett’Hôtel Oloron Sainte-Marie for your holidays in the Pyrenees, and charge through the skiing stations and nearby medieval towns. 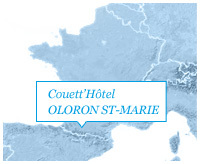 Choose the Couett’Hôtel Oloron Sainte-Marie for your professional trips and cross to the Pau in Spain, and from Lourdes in Saint-Jean-Pied-de-Port. Family rooms until 5 pers. ➜ Couett'Hôtel Saint Jean d'Angely en Charente Maritime.